Hazoor Sahib’s own rich story has, until now, been somewhat lost in the annals of history and this book gives it the place that it deserves. Hazoor Sahib, which literally means "Master’s Presence", is the shrine built at the site of the cremation of Sri Guru Gobind Singh, the 10th and last living Guru of the Sikhs. The book is the first of a two-set volume and gives new dimensions to the understanding of Sikh heritage. It is the result of over 10 years of methodical and meticulous research, drawing upon sources in Hazoor Sahib, Maharashtra, and libraries and museums around the world. It’s a wonderful story, well told. Fundamentally, it is a tale of survival, often against all the odds of people, their way of life, the preservation of a settlement and the protection of a historical site. Its narrative weaves around the thread of the way of life of Akali Nihangs who were originally the core of Guru Gobind Singh’s followers. Before his death, the Guru gave them specific instructions to carry on the traditions and uphold the way of life which he had taught, that of Degh (cauldron), Tegh (sword) and Fateh (victory). The Nihangs were recognisable for their unwavering commitment and also for their striking appearance. In the middle of this beautifully illustrated book, one finds a lithograph from the British Library, London. The scene is a gathering of the great and the good, recorded in their sumptuous glory for posterity as they sat watching an evening’s entertainment at the palace of Raja Chandu Lal. This Sikh devotee who served as the finance minister of the Hyderabad state was the chief patron of Hazoor Sahib long before Maharaja Ranjit Singh turned his attention towards it in the 1830s. Glancing along the rows of faces, it is easy to form a view about who they were and what they did. There, silently casting his eyes over the scene, seemingly incongruously, is an Akali Nihang warrior in full dress, armed with a matchlock and steel mace. Who is he, why is he here, what is he, and what does he stand for? Not addressing these questions is to leave history incomplete. This book makes an excellent attempt to answer these questions. Their research is commendable but the inference may not be. Nidar Singh Nihang has dedicated his life to preserving these Sikh martial traditions, and lecturing and teaching about them extensively. He is also one of the most acclaimed contributors to the Asian Art course run annually at the Victoria and Albert Museum in London. He is an imposing figure, who looks as though he’s just sauntered out of some 18th-century military camp in the middle of Punjab that no longer exists. It is his spirit that emerges his book, history happens in this moment. Parmjit Singhtireless research holds the book together. 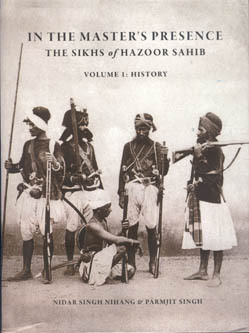 His previous book, the Warrior Saints, Three Centuries of the Sikh Military Tradition, is already a collector’s item. In the Master’s Presence is a substantial piece of work, both weighty enough for the scholar, and easy regarding enough for the interested individual to look through and read it to recognise its very special place in the annals of Sikh and Indian history. The authors have not only brought the past alive, they have also documented the savagery with which in the name urban development and ‘beautification’ of the area around the old Takht has obliterated the heritage buildings and the socio-economic way of life of the Sikhs in Nanded, who had preserved Sikhi against all odds in this settlement in remote South.